Does withdrawing Roth IRA principal trigger taxes and/or penalties? If you withdraw your original Roth IRA contributions prior to age 59 ½, will you owe a 10% early withdrawal penalty? These are legitimate questions, and you need to know the answers if you want to avoid a run-in with the IRS. As a general rule, the answer is no. Withdrawing your original Roth IRA contributions will NOT leave you with a tax bill or stick you with an early withdrawal penalty. Only early withdrawal of investment gains such as interest, dividends, and capital gains are subject to income taxes and/or early withdrawal penalties. So what's an early withdrawal? If you make a withdrawal before these two conditions are met, then it's designated as an early withdrawal. Some early withdrawals are subject to income taxes and/or a 10% early withdrawal penalty. In most cases, early withdrawal of rollover funds, conversion funds, or investment gains will trigger taxes and penalties. However, withdrawing Roth IRA principal is always tax-free and penalty-free. Are there exceptions to withdrawing Roth IRA principal contributions that might make them subject to taxes and/or penalties? Now, the total balance of your Roth IRA account does limit the amount you can withdraw, but you're still able to withdraw as much money as you want up to your original contribution amounts without having to worry about taxes or penalties. For example, let's say you're 27 years old. You open a Roth IRA and put $5,000 in it which you use to buy individual stocks. Two years later, your Roth IRA has a total balance of $2,300 - $300 of which is cash from stock dividends. Obviously, you can't withdraw $5,000, because the stocks you purchased lost value. So how much can you withdraw? Can you withdraw the $300, even though it constitutes "investment gains"? In this case, you can withdraw the full $2,300 tax-free and penalty-free if you wish. If your account has a balance of $5,000, you can withdraw the full amount tax-free and penalty-free. But if your account has balance of $5,300, and you only made $5,000 in original contributions, then all you can withdraw is $5,000. If withdrawn, the remaining $300 is subject to income taxes and a 10% early withdrawal penalty. Let's illustrate this concept with another example. Say you make five annual $5,000 contributions to your Roth IRA. During those years, you also withdraw $2,000. Today, your Roth IRA is worth $37,000. How much can you withdraw from your account without having to pay taxes or penalties? In most cases, if you're younger than age 59 ½ then you need to make a formal withdrawal request with your broker. You'll also need to fill out IRS Form 8606 and file it with your regular tax return. 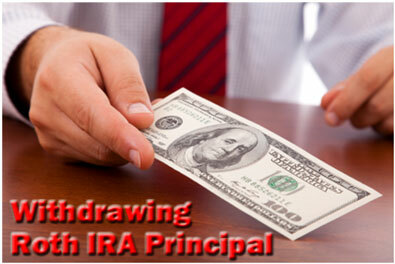 Withdrawing Roth IRA principal is always tax-free and penalty-free. Only early withdrawal of rollover funds, conversion funds, or investment gains will ever trigger an income tax bill or an early withdrawal penalty. If you want to know how much you can withdraw tax and penalty free, simply subtract the lifetime total of your withdrawals from your lifetime total of after-tax contributions. The amount you're left with is the amount you can withdraw worry free!